You know I love me some new makeup, right? 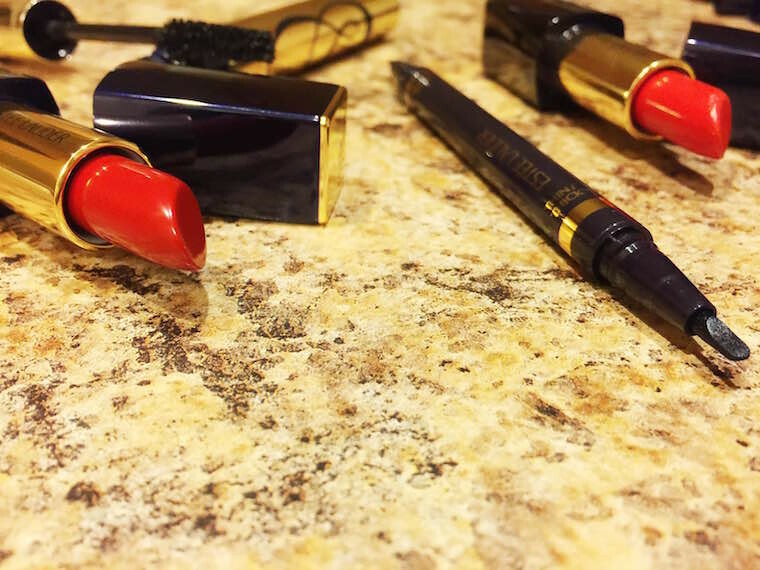 Now I’ve been turned onto the new Estée Lauder collection because of all the beauty bloggers and YouTubers chatting away about their favorite shade from this new lipstick collection… so I figured I’d have to give this new line of lippies a go. The lipsticks are lovely. These are the new Pure Color Envy Matte Sculpting Lipsticks. 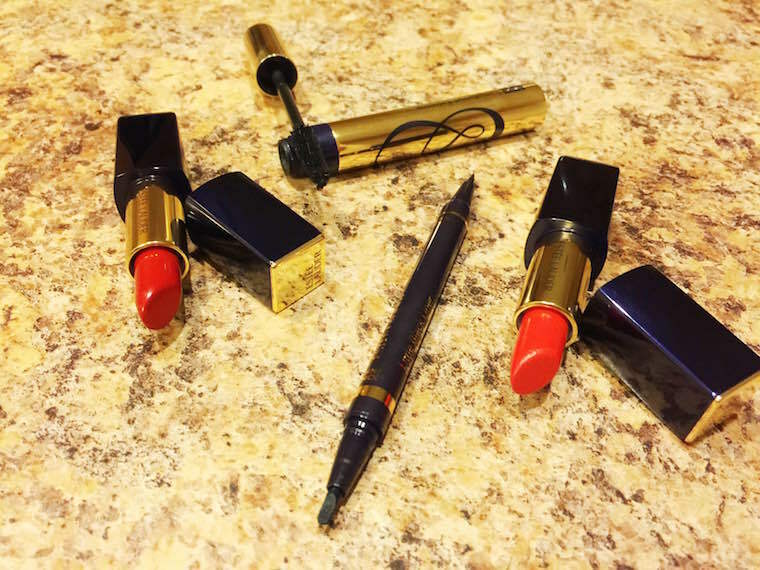 They’re creamy, rich in moisture, vibrant and just feel like absolute silk on the lips. Now don’t get me wrong, they’re not matte like the liquid lipsticks that you have trouble removing at the end of the day, but they do have some good lasting stay power (couple of hours.) 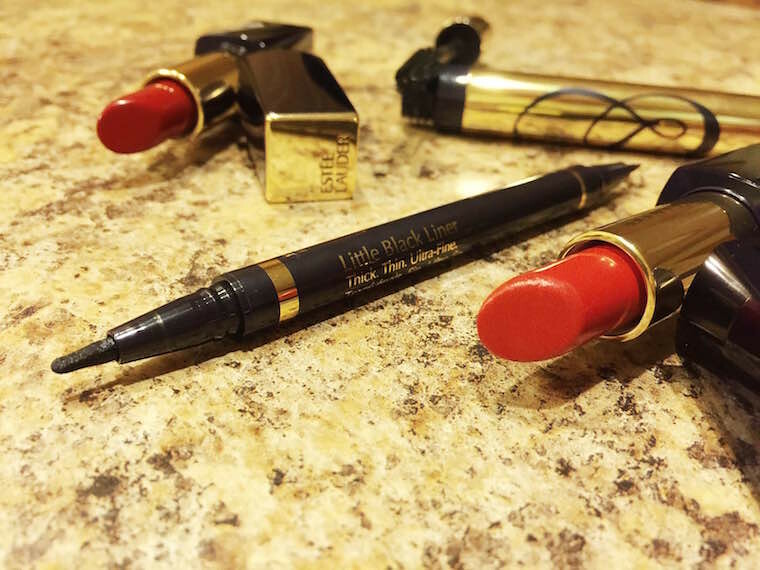 However, they won’t stick on your lips through all of your shenanigans so make sure to throw this adorable lipstick into your clutch or purse for the evening because you’ll want to reapply this bad boy on your lippie lips. I’ve got the shade ‘Vengeful Red’ and ‘Carnal.’ Muah! I honestly will not rave too much about the eyeliner, but it’s the best eyeliner I’ve ever used in my life. Little Black Liner they call it and it is in-freakin’-credible! Bold statements, people, bold statements! It’s two-sided, you get an ultra thin side to get your tight line in check and you get the thick and thin side that’s that’s separated by which side of the brush you use. Genius if you ask me. The thin side creates the classic thin liner and the thick side is going to give you more of that dramatic thick liner. Having said all of those, it’s clear that this single liner gives you three options: thick, thin or ultra-fine. I tend to go for the ultra-fine but no matter how good the product is my hand will always slip and create a thicker line which now doesn’t look so horrendously ridiculous because I’m using the thinnest liner tip. Make sure to shake the liner before each use because this gets the product to the very tips of the brushes and allows for easier more efficient use. Because I spent so much $$ for those three products, I got a goodie bag (as always) and a full size tube of one of their newest mascaras. I choose the most popular one which happens to be the Sumptuous Bold Volume Lifting Mascara. It does wonders for the lashes even without me curling my lashes beforehand which is a big ole plus for yours truly. We’re all rushing in the morning and we do not have time for additional steps. This is a flick and go mascara and doesn’t require unreasonable amounts of coats either so I’m a fan. All in all, I’m quite pleased with my purchases and I’m dabbling with Estée Lauder again and I have to admit that the quality has improved significantly over the past few years. What products do you have Estée?